Do me a wedding favour! Classic golds, and ivories, deep seductive burgundies, feminine lilacs and pinks – whatever your bridal colours, reflect them in your favours and really put the Wow! factor into your reception. Fabulous favours can make the tables at your reception look fantastic, whether you go for a contemporary or classic look and whether you buy them ready-made or make your own. 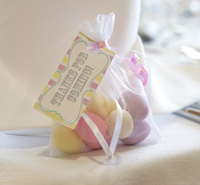 Traditionally, favours are five sugared almonds, signifying health, wealth, fertility, long life and happiness. They are both a token of thanks to your guests and a celebration of your very special occasion. Share a little of your wedding happiness by helping a charity. 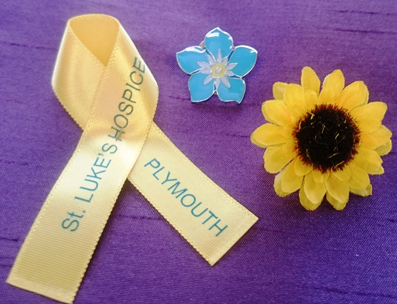 Rowcroft Hospice offers enamelled pins with a personalised favour card, explaining that instead of favours, you have made a donation. The pins cost £1.50 each and have already proved a huge hit with wedding guests. St Luke’s Hospice selection of wedding favours are a unique way to include charitable giving as part of your special day. Your family and friends will be taking away a small token to celebrate your wedding and you will be helping to raise vital funds for St Luke’s.